3 stars of high school drama and music. 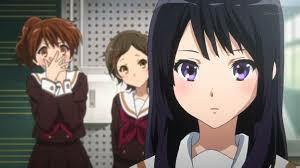 Sound Euphonium is based on the Japanese novel series by Ayano Takeda. It is adapted to anime by Kyoto Animation (Free! Eternal Summer, Love, Chunibyo and Other Delusions! Heart Throb) and directed by Tatsuya Ishihara (Clannad). It is presented here in the original Japanese with English subtitles, courtesy of Anime Ltd. and comprises the whole first series, 13 episodes. 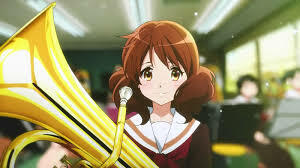 After swearing never to play music again following to an incident at the middle school regional concert band competition, during which she fell out with a close friend, euphonist Kumiko Oumae (Tomoyo Kurosawa) enters high school hoping for a fresh start. As luck, or otherwise, would have it, she ends up being surrounded by people with an interest in the high school brass band. Reluctantly, she agrees to join and despite her insistence that she wishes to play trombone, once again ends up with a euphonium. Kumiko finds the missing enthusiasm she needs to make music once more with the help of her high school bandmates, some of whom are new to music, like novice tubist Hazuki Katou (Ayaka Asai), while others are experienced, like veteran contrabassist Sapphire Kawashima (Moe Toyota) and band vice president and fellow euphonist Asuka Tanaka (Moe Toyota). 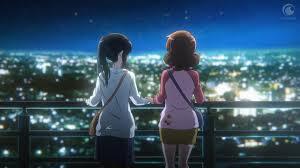 Others are old friends, like Kumiko’s childhood friend and hornist-turned-trombonist Shuichi Tsukamoto (Haruki Ishiya), and trumpeter and bandmate from middle school, Reina Kousaka (Chika Anzai). However within the band, order is hard to come by and rivalries are fierce. Despite stating their intention to qualify for the national band competition, at the current standard, just competing in the local festival will be a near impossible challenge, unless the new and far stricter band advisor Noboru Taki (Takahiro Sakurai) can do something about it. It is up to them to learn to take his advice, put aside their differences and pull together to reach their goals. 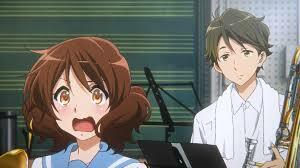 Sound Euphonium is an enjoyable series to watch. 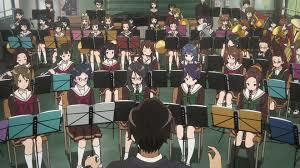 In places the music is very good (not so much when they are practising) and the animation is lovely. The characters are well written and easy to identify with and it’s a traditional tale of setting goals and working together to achieve them. My only worry is that it does seem to be aimed at a very niche market, i.e. people who have been a member of an aspiring concert band. Whether this would put off the casual observer I couldn’t say, but I fear it may do. However, it still serves as an uplifting story of teamwork and achievement. Worth adding to your collection if you are a fan of slice-of-life anime. 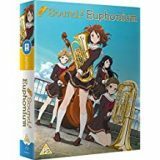 Sound Euphonium is available to buy now on Collector’s Edition Blu-ray.